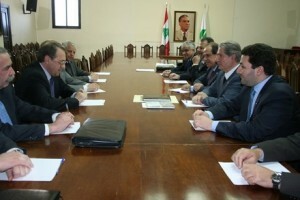 “We agreed with the Phalange Party to activate contacts between our two parties and between the institutions … in the framework of finding solutions to the region’s problems,” Bogdanov said after meeting Gemayel, in his first meeting after arriving in Beirut on a 4-day official visit. Asked about Hizbullah’s military involvement in Syria, the Russian diplomat said he will discuss the issue with Lebanese officials and inform the Russian leadership of the outcome. 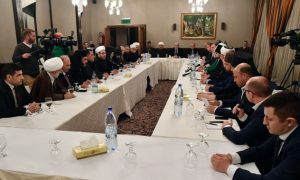 “I don’t have a meeting with Hizbullah’s secretary-general, but I will hold meetings with lawmakers who represent all the political parties,” Bogdanov added. For his part, Gemayel called for holding a conference in Beirut on the affairs of Syrian refugees in Lebanon and Syria’s other neighbors, noting that the Russian official welcomed the proposal. 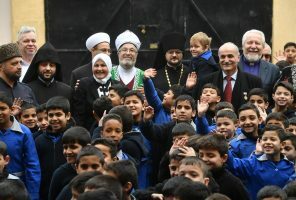 Separately, Bogdanov described the abduction of two prominent Orthodox bishops in the northern Syrian province of Aleppo as a “grave crime,” noting that the incident raised the concerns of Russia’s leadership, society and church. 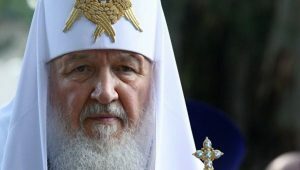 “As a Russian state and church, we will exert all efforts possible to secure the release of the abductees in Syria and to resolve the current crisis in that country,” he added. Bogdanov arrived in Beirut on Thursday on a four-day official visit to hold talks with senior Lebanese officials as part of his regional tour. Bogdanov’s visit comes in light of the rising threats caused by the Syrian turmoil as the cross-border violations increased recently. Lebanon has suffered a significant spillover of Syria’s conflict, with frequent cross-border shelling of both Sunni and Shiite areas in the north and east. The diplomat will also reiterate his country’s commitment to aid the Syrian refugees fleeing the conflict in the neighboring country. Lebanon hosts the region’s biggest Syrian refugee population, which the U.N. says exceeds 430,000 people.